My photographs are sold as limited editions, generally with editions of 10 or 15 per series. Which photograph do you want to own? Which size do you need. Sizes are generally available from 20 up to 200 cm (long side). My photographs are generally in landscape format, but for some pictures I may be able to propose an upright format (and vice versa). After receiving your information, I will send you a quotation taking into account the print size and type, current exchange rates and expected shipping costs. You may expect delivery in about 2 weeks after I have received your payment, depending on your location. Currently, I can offer payment via PayPal or bank wire/bank transfer only. Please see the table below for approximate rates depending on print type and size. Any tax that may apply in your country is on your expense and responsibility. 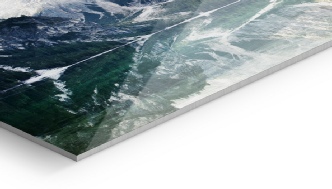 Glossy print on photo paper, mounted between alu dibond and acrylic glass. Comes with an aluminum rail for hanging on the back side. 1 mm aluminum plate. Comes with an aluminum rail for hanging on the back side. (3 different border sizes available). please click here to open a new window with some customer feedback.